FLIR Commercial Systems has produced an informative guide which details the role that Optical Gas Imaging (OGI) is likely to play in the Refining of Mineral Oil & Gas BREF (Best Available Technique Reference ) as part of the new European Industrial Emissions Directive (IED). Industrial activities play an important role in the economic well-being of Europe contributing to sustainable growth. However industrial production processes also account for a considerable share of the overall European pollution created by emissions of greenhouse gases and acidifying substances, wastewater emissions and waste. In order to take steps to reduce emissions from such installations, the European Commission adopted the IPPC Directive on industrial emissions on 21 December 2007. The IED is a successor to the IPPC Directive and in essence, is about minimising pollution from various industrial sources throughout the European Union. Steve Beynon, EMEA Region Business Development Manager for GF Cameras & Optical Gas Imaging at FLIR Commercial Systems commented “Optical Gas Imaging, was first introduced by FLIR Commercial Systems as a commercially available technology within the EU in 2006. 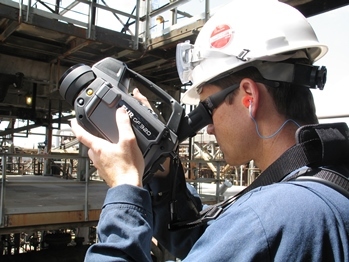 Since the introduction of the GasFindIR camera in 2006 and then the second and current generation, FLIR GF320 in 2009, over 2000 FLIR OGI cameras have been supplied to end user operators, service provider companies and EPA’s (Environmental Protection Agencies) worldwide. Many of the end users of FLIR OGI technology are involved with technical working organisations that acquire pertinent scientific, economic, technical and legal information on environmental, health and safety issues relating to the refining of crude oil and the distribution and use of petroleum products, such as CONCAWE.